A century ago C. H. DOUGLAS revealed to the world that BANKS CREATE MONEY OUT OF NOTHING. He challenged the monopoly of credit and those who control it. Increasing and UNREPAYABLE WORLD DEBT has rekindled interest in Douglas' works. Douglas' discovery was not entirely original. Others had seen that there was something wrong with the money system. Thomas Attwood, founder of "The Birmingham Political Union" and leader of the Midland Chartists, traced the depression of trade to a flaw in the monetary system, the correction of which would he maintained, achieve all that the "Great Charter" demanded. Douglas' ideas had their roots in the work of William Cobbett, John Ruskin and his "Guild of St. George," William Morris and his "Arts and Crafts Movement," Hilaire Belloc, (author of “The Servile State") and the Distributist League, but most of all in ‘The New Age’ edited by A R Orage and Arthur Penty, the journal of the Guild Socialist Movement. It was in the pages of The New Age, that Douglas' ideas were first presented to the public. Penty, who also wrote for G.K's Weekly, became the bridge between Distributism and Social Credit. 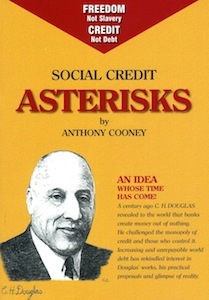 Social Credit is therefore the culmination of a Iong process of radical and reformist thinking and action. What was unique in Douglas' "glimpse of reality," were the solutions he proposed. Debt is really a measure of increased productivity. This increased productivity is Social, and it ought not to be a debit against society, but a Credit, to be shared by everyone through a birthright.